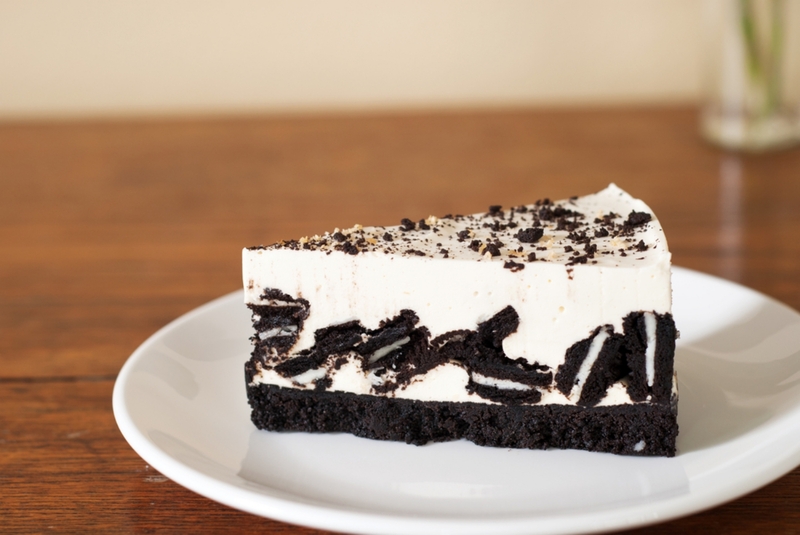 This Oreo Cheesecake Is Cookies And Cream At Its Best! Did anyone else besides us crave Oreo cookies at lunch or snack time growing up? These cookies were gold on the playground, used as bartering chips or guarded carefully so as to not draw attention to their yummy presence. It’s a been a while since those playground days, but our love for Oreos has not faded and we thought it would be cool to find a way to elevate their consumption– not that it’s even necessary! This cheesecake is the perfect way to do it. A classic cake with a classic cookie and it’s easy to make – could it get any better?! Transfer mixture to a 9-inch springform pan and press Oreo crust into the bottom. In a large bowl, beat cream cheese, sugar and vanilla until well blended. Add eggs individually, making sure to blend mixture fully before adding the next egg. Pour cheesecake mixture into the springform pan and bake for 35-40 minutes, or until center is almost set. Remove from oven and refrigerate for 4 hours (or overnight). Optional: crush remaining Oreos and sprinkle them over the top of the cheesecake, then serve and enjoy!